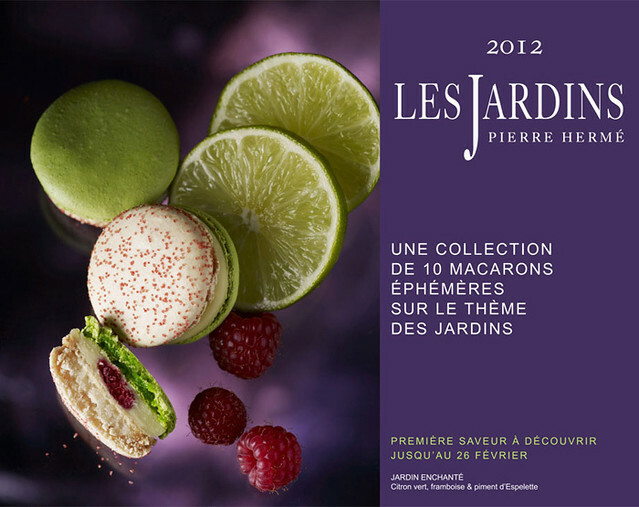 2012 is an exciting year for PH’s macarons with the launch of a brand new series of 10 new flavours under his “Les Jardins” collection. Each uniquely conceptualised, the macaron series will take us on a stroll through various thematic gardens reflecting the changes in moods, color and season. 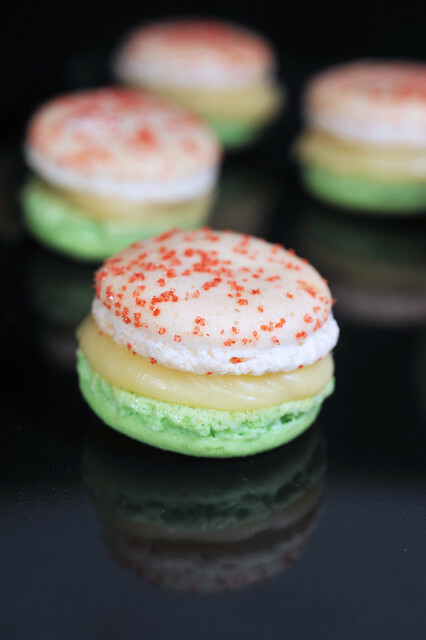 First to be showcased, just last month was Macaron Jardin Enchanté, a beautiful green and red polka dotted piece amalgamating lime, raspberry and espelette pepper. I was immediately curious about the pairing of raspberries with lime, both fruits with very distinct and sharp flavours. How would these two work together? And the incorporation of espelette pepper is most intriguing, an ingredient which was totally new to me. As this was a brand new flavour just out of the oven quite literally, I was totally clueless about its composition. No receipes whatsoever. Thus before I could work on its reconstruction, there were some burning questions to be answered. (1) The filling is lime-flavoured, that much we know. But what is the carrier for the flavours? That required some deciphering. “Such a easy question to answer right? !” one might say but a quick search over the internet revealed two different sets of feedback! Some bloggers were fortunate to have tried the piece when it made its brief appearance a month ago when it was available in the PH stores shared views which can’t be any more different! A fellow french blogger reiterated ganache not once but twice when I asked her over her blog. She seemed so fervent and determined that I was too timid to ask another time. NO! You don’t want to anger a French woman, trust me. Yet, another lady who tried the piece cited buttercream. I am left confounded. So which would I choose if I am Pierre Hermé? Buttercream or ganache… ganache or buttercream … buttercream or ganache…But I am NOT Pierre Hermé, so how the hell would I know?! Yes, bordering schizophrenia here. (2) Figuring out the raspberry in the centre met up with similarly “interesting” discussions. gelée? confiture? I seriously doubt so. The French lady said gelée. Another said she tasted one whole raspberry but it was quite non-descript. Discussed this with Chef Nicholas from Pave and we’d decided that it would be freeze-dried raspberries, which I was lucky to have some (meant for Madeleine Ispahan but those can wait!). And best part is, no cooking for confiture and preparation of gelée! Yipee!!! (3) The third and most intriguing component is of course the incorporation of piment d’ espelette aka red peppers from Espelette in Basque country. This is an AOC produce, like Echire butter, and is very locality specific. This supposedly helps to preserve the integrity and standards of the produce. Much of a marketing gimmick if you ask me. But now comes the problem. WHERE into the macaron was it incorporated? The toughest piece of the puzzle to solve. PH had called for the use of espelette peppers in his lesser known (read: more exotic) macaron recipes, where an entire pepper was blanched in boiling water and then plunged in cold water repeatedly, before removing the skin. The semi-cooked pepper is then pureed before incorporating into a dark chocolate ganache. The latter’s dark and intense hue easily conceals the pepper’s fiery red but this is clearly not the case for Macaron Jardin Enchanté, as the filling remains rather pale. A tough nut to crack! Thankfully I wasn’t alone! I roped in Swee San from Sweet Spot, as well as Chef Nicholas for help. 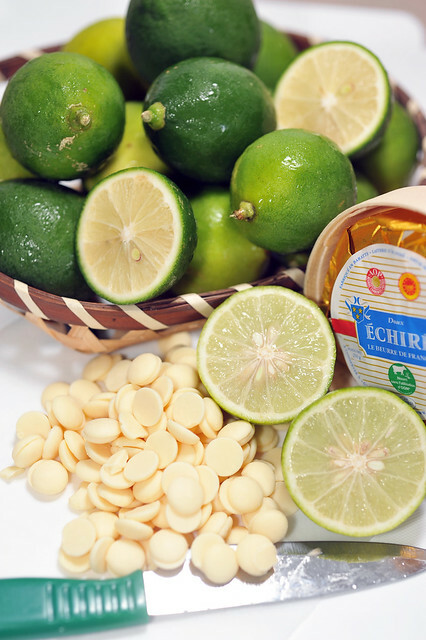 One of the earlier mentioned bloggers shared that the taste of the espelette pepper was almost non-existential, being very mild and could be captured only towards the end of the tasting experience. So the conclusion derived was just to do a simple dusting of the whole freeze-dried raspberries with dried powdered piment d’ espelette . Sourcing for it was another problem, but thankfully, a local gourmet store carries it and I was lucky again to be able to get some, big thanks to Chef Nic again for pointing out the source to me. With everything seemingly in place, the macaron was finally reconstructed, after 3 weeks’ of procrastincation mindful deliberation. And here’s the beta version of the recipe. Sift icing sugar with ground almond to make “tant pour tant”. Stir the green food coloring in the first portion of egg whites and pour over the sugar-almond mixture without mixing. When the sugar reached 118°C, pour it over the egg whites little by little. Whisk and allow the meringue to cool to 50°C, then fold HALF OF it into the ground almond-sugar mixture. Save the other half for the pale-colored shells. Spoon the batter into a piping bad fitted with a plain nozzle. Pipe rounds of batter about 3.5 cm in diameter and spacing them 2 cm apart on baking trays lined with parchment paper. Rap the baking trays gently on the work surface covered with a kitchen cloth. Leave the shells to stand for at least 30 minutes until they form a skin. Preheat oven to 180°C and put the tray into the oven and bake for 12 min quickly opening and shutting the oven door twice during the cooking time. Our of the oven, slide the shells on to the work surface. Sprinkle red sugar crystals over the shells during drying. Baked shells ready to be filled in and assembled. Halve the limes and juice to obtain 200g of juice. Zest the peel with a microplane. Weigh the juice and take it to a boil together with the zest. Heat creme fraiche or whipping cream until it just begins to boil and pour over chopped chocolate in a mixing bowl over a pan of barely simmering water (bain marie) to partially melt it. Pour in lime juice in 3 successions over the chocolate. Take care to strain away the zest at the same time. DO NOT incorporate the zest into the ganache. When the mixture temperature is at 60°C, add the butter pieces a few at a time. Stir until the ganache is smooth. Pour into a dish. Cover the ganache by pressing clingfilm over the surface. Set aside in the fridge for the ganache to thicken for a couple of hours. 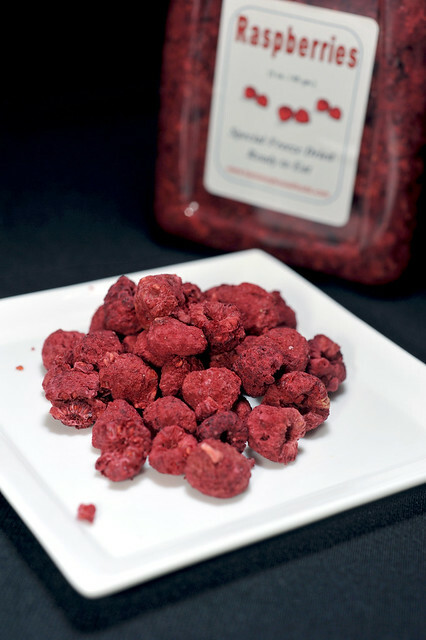 Roll freeze-dried raspberries over a dish containing powdered espelette pepper and gently shake off the excess by tapping and rolling them around in a colander or wire sieve. Check that the raspberries are only lightly laced with pepper by tasting one. The taste should be rather subtle but noticeable. Fill a pastry bag fitted with a plain nozzle with the ganache. Pipe a generous mould of ganache onto the green shells. Place a freeze-dried raspberry over the ganache and pipe another small dollop over the raspberry to conceal it. Top with the pale-colored shells. 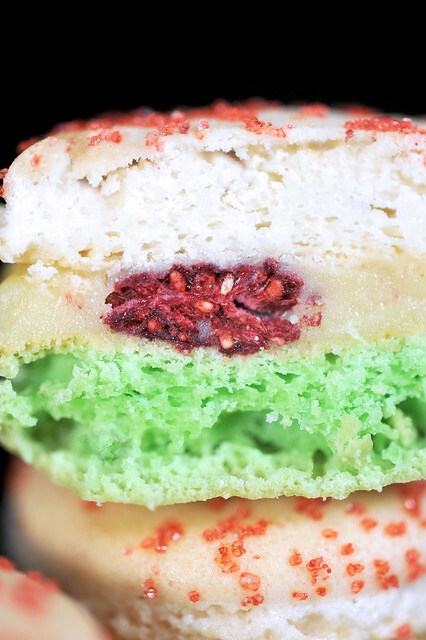 Store the macarons for 24 hours in the fridge and bring out 2 hours before serving. This is the first time I am attempting to reconstruct PH’s macarons without a recipe. Having attempted some of his other macarons before most certainly helped decipher the motivations behind the components. But most of the earlier ones like Ispahan, Montebello and Satine were mostly “follow the recipe” kinda executions. This was the most mind-boggling experience so far but hey, what’s life without some challenges once in a while yeah? Red sugar crystals can be prepared by mixing thoroughly granulated sugar crystals with red gel-based food coloring. I worked with Wilton and the results were very satisfactory. Liquid coloring may cause the sugar crystals to dissolve and thus not ideal at all. Powdered coloring is totally useless here. After very thorough melanging to ensure that every sugar crystal is well-coated with coloring, spread the damp crystals onto a piece of baking sheet and place inside a conventional oven at the lowest possible temperature setting. It should ideally be around 60C but keeping the temperatures lower than 100C works well. Leave the door slightly ajar by placing a wooden spatula between the door and oven. Periodically check on the sugar crystals and take the baking tray out of the oven once they feel dry to touch. Leave to cool completely before transferring to a ziploc bag or small container for storage. The flavours most definitely have a sharp edge, which I thoroughly enjoyed! Truth is, I made the ganache twice. 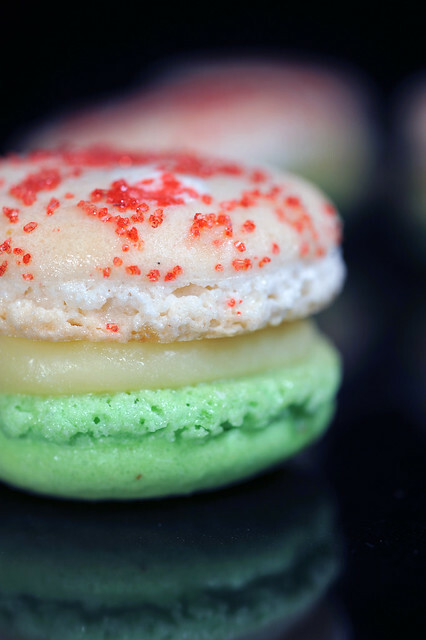 The first time round, I’d use the chocolat au lait et fruit de la passion ganache filling for Macaron Mogador as a basis and simply replaced Jivara with white chocolate couverture and passionfruit juice with lime juice. But the concoction was immensely acrid, even for a person who loves tart flavours like me! So I adjusted the proportions by decreasing the lime juice from 250g to 200g and topped up the difference with creme fraiche. The acidity is more manageable. The lime juice could probably be decreased further by another 10% but no more than that! Anything less and the flavours would be masked by the sweetness from the white chocolate couverture. The freeze-dried raspberry is very aromatic to start with and helped by providing a bit more lift, but I would probably add two per macaron instead of just one to boost the aroma and flavours a bit. 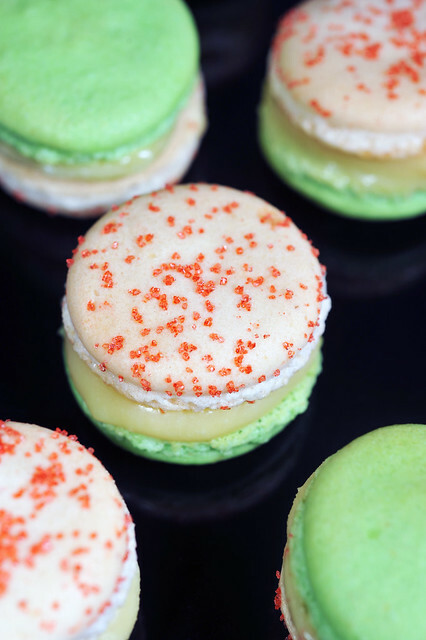 They soften slightly upon leaving the macaron to “mature” overnight, using moisture permeating from the lime ganache and blended well into the ganache. Espelette pepper wise, it was really mild, with a bit of heat hitting the back of the mouth only towards the end. It has a smoky quality which is similar to paprika but provided a milder and more rounded taste than the latter. I guess paprika would provide a decent alternative but still not quite the same. Overall, I’m pretty satisfied with the results of this reconstruction, though regrettably I’d never tried Macaron Jardin Enchanté for comparison and probably never will. Will I try to reconstruct any of the other macaron flavours in the “Les Jardins Collection”? Hell yeah!!! 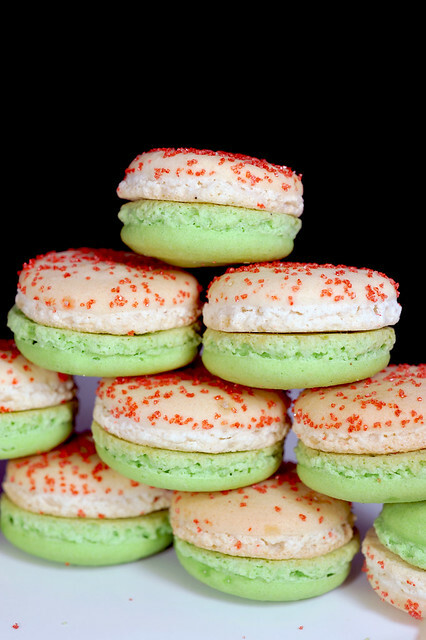 PS: Going into the last week of March, tis the last 7 days to make some macarons and join in the fun if you have not! This entry was posted on March 26, 2012 by Alan (travellingfoodies). It was filed under Food, Simple Eats and was tagged with citron au vert, espelette pepper, framboise, les jardins collection, lime ganache, macaron jardin enchante, macarons, Pierre Hermé, piment d'espelette, raspberry. Wow I am totally blown away! Amazing effort. Thanks Edith! In retrospect, its not that difficult actually. Just that I procrastinated for too long…. my gosh – this is a work of art, truly, you. ;D can i ask where did u get those freeze dried raspberries from? ive been dying to get my hands on freeze dried berries! Hi Michelle! They are not that difficult to make actually. Once all the components are sorted out… for now at least! My sis carried back the raspberries from US actually. Not sure if they are available locally. Such a shame really because the flavours are so intense! Alan, these macarons are just irresistable. Oooo… clever idea of adding a dash of espelette pepper into the raspberry. Seriously, I have all the flavours running wild in my imagination when I read through the recipe ingredients. Love it !! I always love macaron with raspberries. The best combination. Same here! I love the sharp flavours ftom raspberties accompanied by the intense aroma! As mentioned in the reflections, I would probably add one more freeze-dried raspberry into the ganache. The textures after being “reconstituted” by moisture from the ganache made it really yummy! Hello! I know this is totally unrelated but do you know where to get yuzu in Singapore? Not yuzu products but as in the fruit itself. Hi amanda, your question is indeed totally random. 🙂 you can try japanese supermarkets like Isetan and Meidi-ya. They do bring in the fruit when it is in season. Oh oh. I guess the yuzu season has just passed. Thanks anyway! on a random note, if your blog still functional? I’d tried clicking on it several times over the last few days but the “not available or already taken down” message kept popping up! Wow! I’m very impressed and would love to taste these! I think you might be ready to try your own creation, you seem to have a grasp of how to combine flavors. I hope you post all the ones you try from here on…. I just saw that last night but haven’t had time to really concentrate on it. It did look pretty amazing. I’ve never had a blood orange that was very tasty, is that just how they are or have I never had a good one? I want to make the confiture for sure! LOL your silence is more assuring than words from others! wow…was this hard to make?